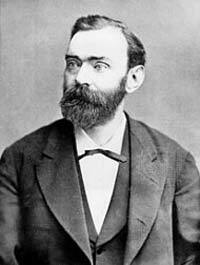 Alfred Nobel was born on October 21st, 1833 in Stockholm, Sweden. History shows that the men in his family were mostly engineers and businessmen and Alfred was quick to follow in their footsteps. In 1842, Alfred and his family moved to St. Petersburg where his father, Immanuel Nobel, had built a factory for armament a few years earlier. His father used to manufacture land mines for the Tsar’s army where he often made good profits. All throughout his life Alfred showed a lot of wit especially in his ability to quickly master foreign languages; he mastered four foreign languages. Alfred also showed great intelligence in natural sciences, especially in chemistry. In 1850 he went abroad to study chemical engineering. He travelled to Sweden, France, Germany and the United States before returning to Sweden in 1863. While in Sweden he devoted most of his time to the study of explosives. In particular, he was interested in the safe manufacture of a compound called nitro-glycerin. Nitro-glycerin is a highly unstable explosive. Nobel was interest in it mainly because his brother Emil has been killed in an explosion caused by the substance. He added the nitro-glycerin into silica. This made the compound safer and easier to manipulate. In 1867 he perfected the science and called it dynamite. Dynamite was what made Nobel one of the most famous chemists in history. Dynamite was then used all over the world for blasting tunnels, building railways, roads and cutting canals. Nobel went on to create many other kinds of explosives and his work was recognized all over the world. He even received an honorary award from the Royal Swedish Academy of Sciences. They recognized his inventions which were of practical use to mankind. This award drove him to achieve many other science awards. In the 1870’s and 1880’s Alfred was able to build quite a number of factories all over Europe that were used in the manufacturing of explosives. He bought an ironworks facility in Sweden in 1894 which later became the center of the famous Bofors arms factory. By the time Nobel died he had registered over 355 patents. It took quite some time before Alfred was able to write up his will. The final version of the will stated that all of his fortune should be reserved for presenting annual awards in the fields of chemistry, physics, medicine, literature and peace. An economics prize was also added later. Nobel died at his home in San Remo on December 10th, 1896 and is buried in Stockholm, Sweden. The contents of his will became known after his death. With this generosity and selflessness, Alfred Nobel founded the Nobel Prizes which have inspired and motivated many people in different fields.